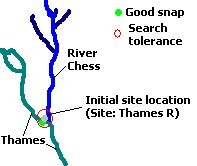 •The sites you wish to snap to the river network will typically be derived from other sources such a GPS, manually determined from maps or entered into a spreadsheet. •Such data is prone to inaccuracies and will result in the analysis of your data being flawed when run through software such as RivEX which cycles through the data automatically. oGross errors placing the site many kilometres away from the intended river. oSmall errors which displace it slightly but have considerable impact if the site is near a confluence. 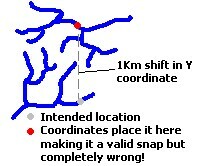 •If your criteria for snapping a site to a river was simply the nearest point on the polyline then a gross error which places your site 100km away from the intended river but places it upon another river would be a valid snap! The problem with such logic is that there is no context other than the spatial relationship ( point near a polyline ). You need to be providing more information with your site and network and the most common contextual information is the river name. 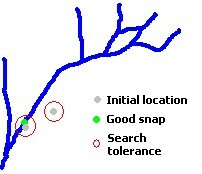 •If the error in your site coordinates was small and your site happened to lie within a non- branching section of the river then the effect of the error in coordinates is none (unless your search tolerance is set to very small and stops it finding any polylines). •If the error in your site was small but your site was near a confluence then the site could potentially snap to the wrong tributary. This would affect all upstream analyses. •Imagine if your site was a large gauging station on a 5th order river but the coordinates placed it upon an upstream 1st order steam. All your upstream analyses would be incorrect and all because the person who collected the GPS coordinate sat in their car having their lunch rather than taking the GPS coordinate at the gauging station. . . it happens! 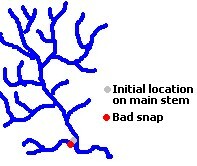 •If your network is attributed with river names and your site data includes the river name then you can use this to quality control the snap. RivEX takes the river name attached to the site and attempts to remove any synonyms such that "River Nile", "R Nile", "R. Nile" and "Nile River" are all reduced simply to "Nile". If any polylines fall within the search tolerance then RivEX will snap to the nearest polyline which contains "Nile" in it's river field name. If no rivers can be found with the word "Nile" then the site is rejected. This clearly offers an improved level of confidence that your site has actually snapped to the correct river. Rejected sites can then be examined manually.